The Anna's hummingbird (Calypte anna) adult male has a metallic green back, dark red head and throat, and a grayish colored breast. The adult female has a green back, grayish breast, white throat with some red spots, and white tips on outer tail feathers. The Anna's hummingbird is thought to have adapted to the presence of humans because it is now a year-round resident in many areas where it was not in years past. In cooler climates they would migrate to warmer places in search of food. As long as humans put out hummingbird feeders and plant hummingbird friendly flowers they should continue to stay year round. 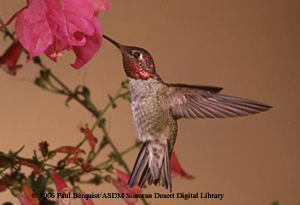 Anna's hummingbirds live in a wide variety of habitats, including open woods, grasslands, forests and deserts. In recent years they have been found more often in backyard gardens where hummingbird feeders and exotic plantings provide them with food throughout the year. They are found from California east to far western Texas, north to southern British Columbia. They are a common year-round resident in lower elevations of southern and central Arizona. Currently their range is expanding and their numbers increasing. These birds feed on nectar from various flowers using a long extendable tongue or catch small insects. They have a wide variety of predators for such a small bird. Some of these predators include tree snakes, western scrub-jays, American kestrels, roadrunners, and curved-billed thrashers. The female hummingbird builds her nest on a wide variety of surfaces, most often on the branch of a shrub or tree.The nest is small and cup-shaped, lined with soft material such as human or animal hair, spider web fibers, fibers from fabric, and feathers. Anna's hummingbirds live an average of 8.5 years. The are about 4 inches in length and weigh 0.10-0.21 ounces. Hummingbirds are the only birds known to fly backward.